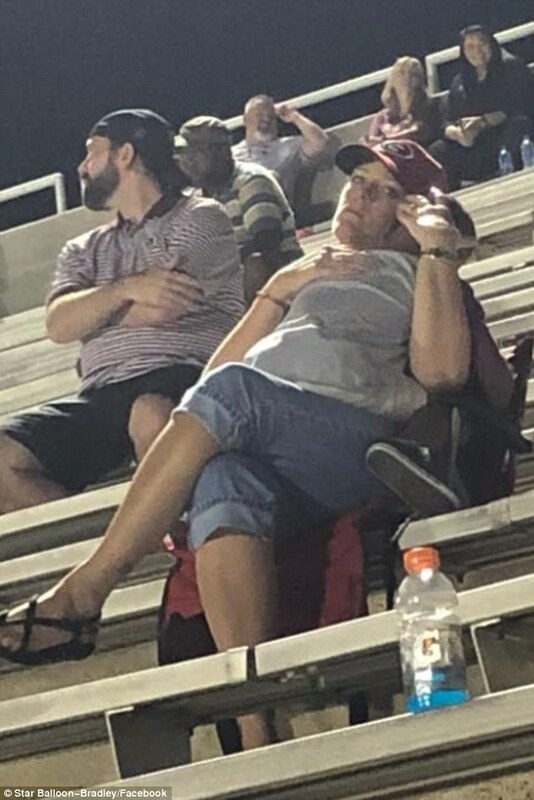 Photos of a young boy being cuddled by a stranger he wanted to befriend at a football game are warming hearts across America. 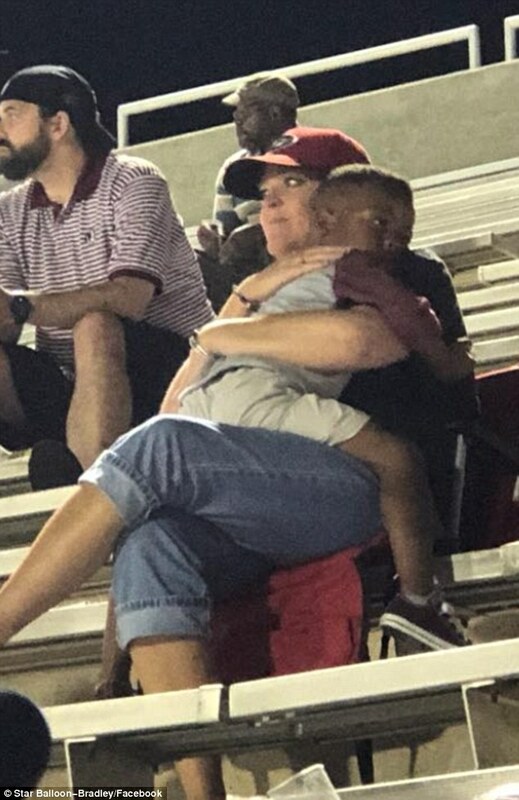 Home Viral Photos of a young boy being cuddled by a stranger he wanted to befriend at a football game are warming hearts across America. 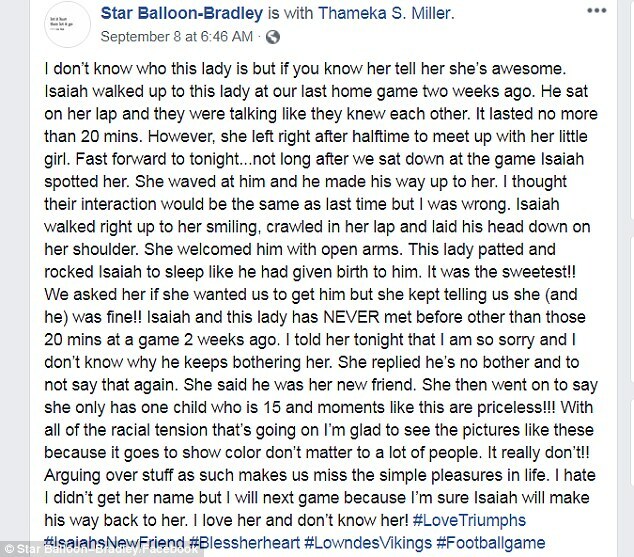 Isaiah was attending a high school football game in Georgia when he spotted a woman he had never seen before and immediately sat on her lap. Star Balloon-Bradley, the boy's aunt, was worried that he was annoying the woman, but instead she happily chatted with him for 20 minutes. 'They were talking like they knew each other,' Balloon-Bradley wrote on Facebook. 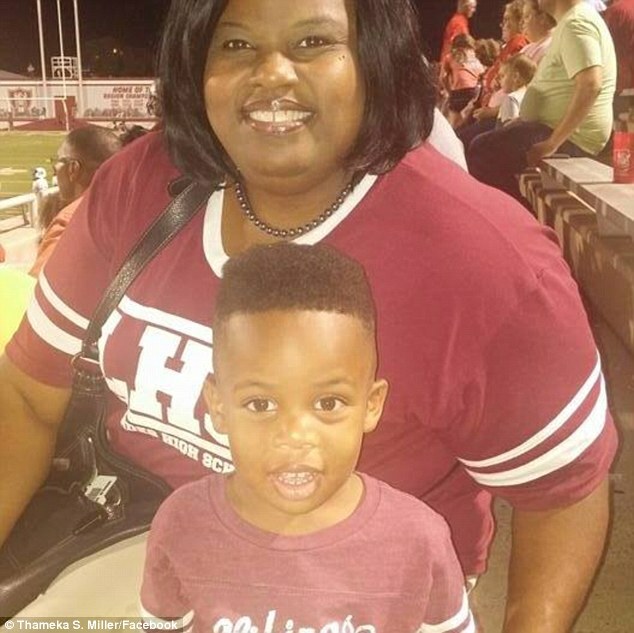 At halftime the woman, who has been identified only as Mrs Angela, had to leave to meet up with her 15-year-old daughter. But it wouldn't be the last time she and Isaiah would cross paths. Two weeks later Isaiah spotted Mrs Angela yet again and she immediately waved to him. 'I thought their interaction would be the same as last time but I was wrong,' Balloon-Bradley wrote. Balloon-Bradley said she kept asking Mrs Angela if she wanted them to take Isaiah, but the woman told her they were both fine. Balloon-Bradley said she went up to Mrs Angela after the game and apologized, telling her she had no idea why Isaiah 'keeps bothering her'. Mrs Angela also told Balloon-Bradley that she only had one child, now 15, and that 'moments like this are priceless'. 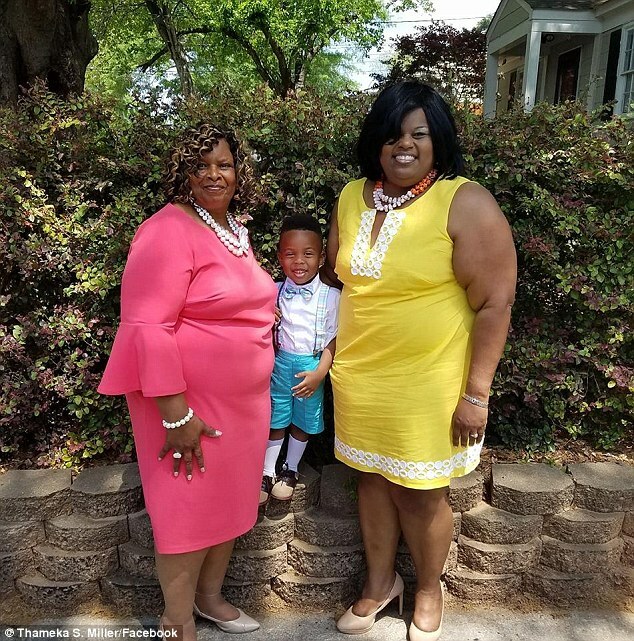 'With all of the racial tension that's going on, I'm glad to see pictures like these because it goes to show color don't matter to a lot of people,' Balloon-Bradley wrote. Balloon-Bradley posted pictures of Mrs Angela cuddling Isaiah on Facebook, where they have since been shared more than 300,000 times. Mrs Angela also saw her post and said it 'overwhelmed' her with emotions. 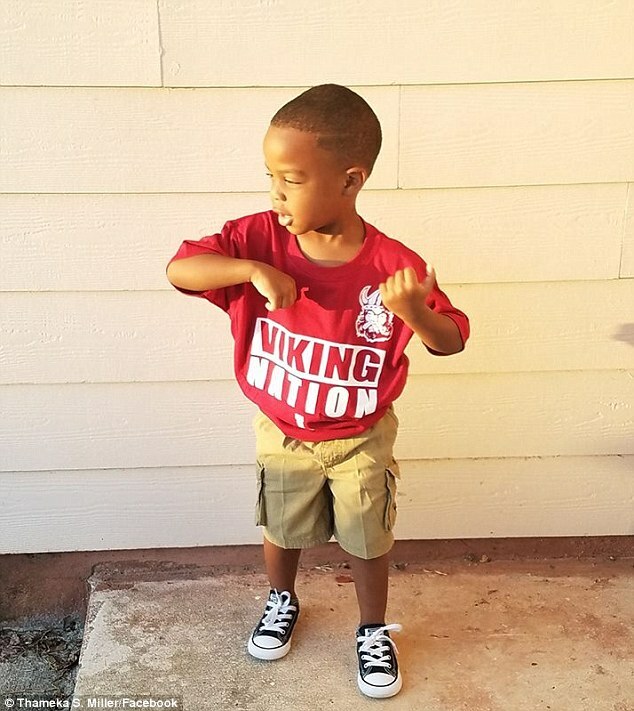 Thameka Miller, Isaiah's mother, also said her heart was 'truly overwhelmed' by the outpouring of love for the photos.